Floor Globes make a great addition to any room in your home or office. In addition to a reference resource, manufacturers are gravitating toward producing more and more floor globes with an antique color/style sphere and dark cherry or dark walnut color stands, making them easier to blend in with most decor. This can be seen amongst the Cram Globes and Replogle Globes product lines. If your decor style tends to be more modern or contemporary, Artline Globes has developed a line of acrylic globes that are very fitting, typically with bo ld ocean coloring. The same can be found within the Atmosphere Globes product line, where metallic coloring seems to blend through its contemporary styling. We have also mentioned the Columbus Globes line in many of our articles. While their ocean coloring is typically blue, the stands exploit the European decor style by featuring silver, gold and dark wood finishes on their stands and meridians. Regardless of the style you choose to fit your decor requirements, you will want to make sure to measure the space you have available for placing your floor globe. 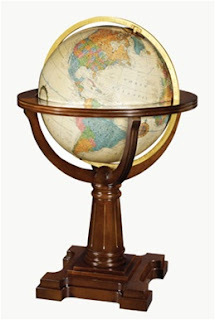 You will find floor standing globes that have a sphere range of 12" up to 45", the most common purchases being in the 16" size and 20" size when considering heirloom quality items. Ultimate Globes Customer Support representatives have been sent to each of our manufacturers to review the manufacturing processes for each of the globes created and offered for sale on our site in addition to the best understanding of the various features you will find on various globes. So if you need assistance in making your choice, make sure to call and we will be happy to share our extensive knowledge from both our experience and the feedback from our customers. A new Floor Globe release from Replogle Globes is the Explorers Collection Limited Edition & Heirloom Quality Annapolis Globe. The first piece in this collection, the Annapolis is a 20" diameter illuminated globe featuring a hand-applied, hand cut map and endless discoveries for the world traveler with over 4,200 place names. This globe includes the most current edition of the World Atlas Executive Edition by Hammond World Atlas Corporation. You will enjoy hundreds of pages of global information detailed with cultural and environmental images. Includes a numbered Limited Edition plaque which you may adhere to a location on your distinguished, dark walnut finished hardwood floor globe stand. The Annapolis globe is made proudly in the United States.